NEW! Buy a GOOD STEWARD book or THE LRM's BOOK OF WISDOM! Each GOOD STEWARD book covers its own topic area-shoe room operation and locker room management respectively-and are the best books available in the industry. They reference problems, then give solutions in an easy reading narrative form. These books should be in the hands of every Locker Room Manager, no matter his level of expertise. The first book is titled, THE GOOD STEWARD-How to Set Up and Operate a Shoe Room at a Country Club or Resort. It shows the Locker Room Manager how to design a work area and a system that fits the needs of members. The book explains how to clean, water-proof, dye, polish, shine and care for different types of shoes; and which products to use for specific jobs. The second book is titled, THE GOOD STEWARD-How to Set Up and Manage the Locker Rooms at a Country Club or Resort. In this book three types of clubs are used as models for the daily operation of locker rooms from opening to closing of the day. How to: set up an efficient, member friendly locker room, what amenities are needed, which duties need to be performed and when are just a few of the topics that are dealt with. The LOCKER ROOM MANAGER'S BOOK OF WISDOM-Information on Salaries, Shoe Care, Amenities, etc. that No Locker Room Manager should be Without is Todd's third book and was completed in the summer of 2008. It contains over 200 tips on every facet of locker room operations taken from four years of e-newsletters that were written for members of the association. It includes 20 questions that were posed to association members nationwide and their answers. It is filled with knowledge and wisdom that can benefit the rookie and veteran locker room manager. As noted, these books can be ordered by calling 'Fore Supply Company at 800-543-5430 for $59.95. The Table of Contents and excerpts from the books are provided below. Click the TOC icon(s) to begin accessing the books. The second LOCKER ROOM MANAGER'S BOOK OF WISDOM 2.0 is Todd's fourth book and was completed in the winter of 2018. It too contains dozens of tips on every facet of locker room operations taken from four years (2013 - 2016) of e-newsletters that were written for members of the association. It includes nearly 50 pages of member comments on various locker room related issues/questions that were posed to association members nationwide and their answers. 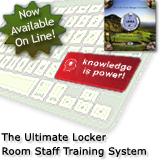 It is filled with knowledge and wisdom that can benefit the rookie and veteran locker room manager.